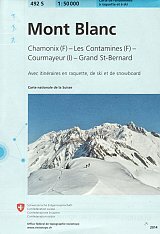 Ski touring map from SwissTopo covering the French and Italian sides (and a corner of Switzerland) of the Mont Blanc area - Chamonix, Les Contamines, Courmayeur, and Grand St-Bernard. 1:50,000 with trails marked for skiing, snowboarding and snowshoeing. Mountain hut contact details are listed. 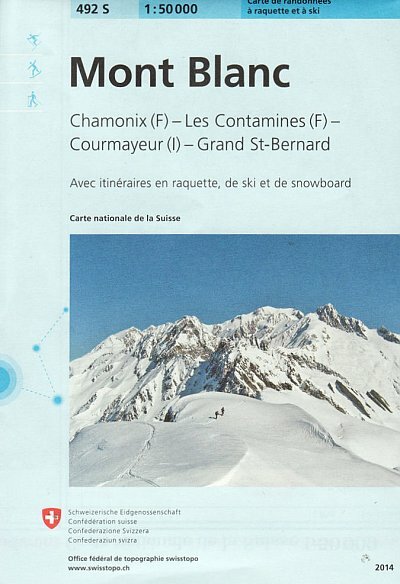 The reverse of the map includes the valley of St Gervais les Bains; Les Houches; Les Contamines-Montjoie at a 1:25,000 scale.